I have chosen the painting below as the front cover for my new CD Time & Tide. It's by a wonderful local artist called Kezy Feaster. 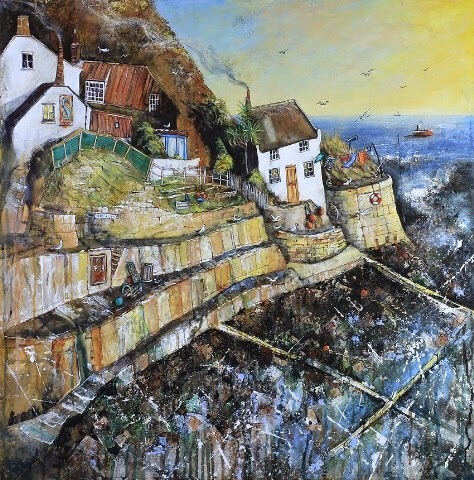 Kezy lives in Pickering and paints fabulous landscapes of coastal villages and moors scenes. She recently had an exhibition in The Sun Inn in Pickering and I was taken by this painting of Runswick Bay and it's lovely bright colours. My partner Jo bought me a print of the painting and I knew it would be perfect for the songs I was putting on the new CD. I would like to thank Kezy for letting me use the painting for the CD cover. Please check out her work she really is a talented artist. Her website is; www.kezyfeaster.com.